As snow begins to melt that runoff could clog storm drains and downspouts resulting in urban flooding. Community members are encouraged to shovel snow from walkways and driveways to make a drainage path for melting snow to flow away from homes. The snow shoveled from these areas should remain on that property and not be placed in the street. In addition, clear storm drains, downspouts, and drainage ditches of snow, leaves, and debris to help prevent urban flooding. For flooding issues call Environmental Services 24hr line at (253) 591-5585. 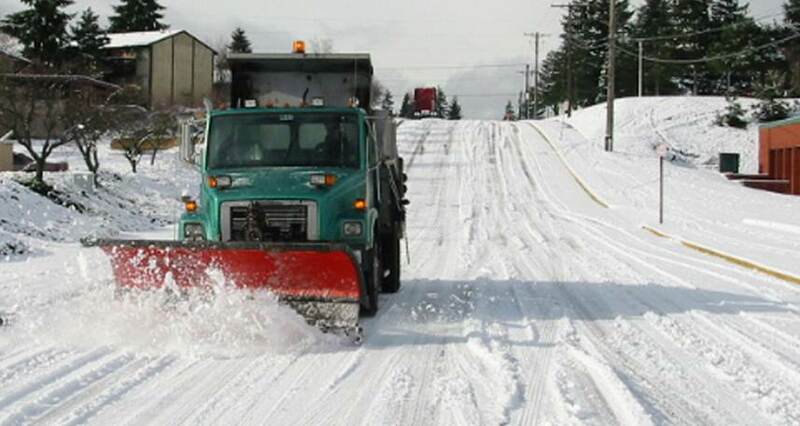 In accordance with Tacoma Municipal Code (TMC) 9.16.050, property owners must see to the removal of snow and ice from bordering public sidewalks every 24 hours. City crews clear sidewalks of snow and ice only from sidewalks adjacent to City-owned properties. Together, these efforts help members of our community to get around safely. City crews plow and de-ice streets on a priority level, beginning with primary arterial streets, followed by secondary and auxiliary routes. City crews clear one lane of traffic in each direction on prioritized Snow Routes. The time required to work through the primary, secondary and auxiliary routes depends on the intensity of a particular snowstorm and how much snow or ice accumulates. Crews aren’t able to remove snow from residential streets. Pierce Transit and the Public Works Department have worked together to make sure transit routes are ready for winter weather, and residents are encouraged to leave their personal vehicles at home and use public transportation during storms. In Tacoma, City crews start anti-icing operations at the first report of freezing temperatures. Crews mobilize and pre-treat the anti-icing routes with salt brine (a saltwater solution), which reduces the bonding of ice to the streets. Depending on the severity and intensity of the forecasted freezing temperatures, crews will pre-treat the City’s street system based upon the following priorities: bridges, bridge approaches, shaded hills, and curves. If snow is also in the forecast, crews will pre-treat designated snow routes. To report icy road conditions, call (253) 591-5495. Equipping vehicles with good tires, windshield wipers, chains, sand, and emergency supplies. Planning driving routes and organizing them by primary, secondary and then auxiliary routes as outlined on the City’s snow routes map. For those living on a hill or somewhere difficult to access in the snow, look for a flat place to legally park your vehicle when snow is forecasted. Also, choose a location where putting on chains can be done safely. For those who live or work on a primary, secondary or auxiliary snow plow route, look for an adjacent street to legally park your vehicle. Doing so will prevent vehicles from getting covered or blocked in by plowed snow and will make it easier for crews to safely plow city street. View the City’s snow routes map. Tacoma’s shelter operators make space accommodations to expand overnight sheltering options while maintaining safety. If you need shelter, please contact shelter operators directly or call 211 to reach United Way of Tacoma-Pierce County. View a list of local shelters. Tacoma Senior Centers follow the same closure schedule as Tacoma Public Schools. For more information, visit the Senior Centers web page. Abutting property owners are responsible for maintaining the right-of-way in a manner that is safe for the public, including fallen trees in planting strips. Public Works will remove sections of downed trees that are blocking the street or sidewalk only. Tree debris will be placed in the planting strip between the sidewalk and the curb by the owner's property for the property owner to arrange disposal of. To report the location of a downed tree, call (253) 591-5495. Power lines from pole to house are the property owner's responsibility to maintain. However, you may report trees hung up in power lines or down lines to Tacoma Power (253) 502-8729. To report an outage please call (253) 502-8602 or report an outage through MyTPU. To have the power shut off for pruning, please call Tacoma Power and leave a message at (253) 502-8729. If your street is flooding, it is often caused by a catch basin that is covered with leaves, plastic bags or other debris. Use a rake, broom or blower to regularly remove debris from the street catch basin grate near your home or business. With more than 18,000 catch basins to manage, the City can't get to them all during heavy rains. We need your help. If the catch basin in your street is clear and there is still street flooding, call (253) 591-5585. For more resources and information visit the City’s street flooding page. The City’s Public Works and Environmental Services departments are providing free sandbag supplies to the public for personal use. While supplies last, community members can come to one of two locations to shovel and load their own sandbags. Both locations are open Monday through Friday from 8 AM to 4 PM, October 1, 2018, through March 30, 2019. Tacoma Asphalt Plant at 3010 Center St. in Tacoma. Call (253) 591-5495 for more information. Central Wastewater Treatment Plant at 2201 Portland Ave. E., Gate 3, in Tacoma. Call (253) 502-2150 for more information. If your containers were not picked up due to especially treacherous road conditions around your neighborhood, please leave your containers out. The City will collect them later. To report a missed pickup or for other questions, please call (253) 502-2100.